Asia’s premiere modelling competition is back for Asia’s Next Top Model Cycle 6 Episode 2 in Bangkok, Thailand! The Top 11 girls got their makeovers and went in black and white swan pairs for their second photo shoot. Who jumped to new heights and who fell flat on the floor? Read on for my Asia’s Next Top Model Cycle 6 Episode 2 review and how the girls fared in their shoot this week. I love, love, love good teamwork. This frame looks like it was captured during a Swan Lake performance. Theirs is the only photo that looks like a dance and where both look like ballerinas. The push and the pull movement is such an interesting focal point in this photo. If this was a singing contest, they were the only ones who harmonized. The rest of the girls were croppable in each other’s photos. An effortless queen! While everyone else jumped in their photos, she was the only one who was captured firmly on the floor. What’s weird is she’s the one who captured the grace and poise of a ballerina the best out of all of the girls. I agree with the judges that even though she’s in that small little corner, she demands all of your attention. Unlike Yu Tsai, I love a little bit of theatricality. The concept of the whole photo shoot is based on a theatrical performance after all, so it fits. A friend noted that her neck was looking a bit stiff in this pic though. Adela worried that her makeover might make her look too innocent and cute. It’s no wonder that she turned up the evil to the max when she embodied the black swan. Though the character she’s portraying seems less Black Swan and more Rocky Horror Picture Show, which I still love too. However, she looked like she didn’t care about her partner at all. Length! We all know Han is tall, but this photo did the impossible and made her look even taller. She looks like a crazy rich asian. Too early to tell but I am getting a feeling that Han may be the dark horse of this competition. Dana looked the part of being ballerina but I’m not too big of a fan of the sleepy eyes in this one. Look at her on her tiptoes and that left leg extension. She does look like a dancer in this photo though the pose makes her look a lot shorter. I also love that she was connecting with Pim even if Pim wasn’t looking. Mia looked like Natalie Portman in Black Swan but her body is all over the place. If she hadn’t focused much on a jump shot, she and her partner could have nailed the shoot. Or if her partner wasn’t too busy being all dramatic. Char! Lucky for her she got two chances at a photo this week, although her second attempt isn’t that much stronger than the first. Cindy noted that her pose in this is the same as last week’s, and I agree. Tu is also not happy. HAHA! Another one with the same pose as last week. The matador stance is a bit baffling. I know it exudes strength, but they were supposed to be ballerinas, right? Jesslyn’s photo takes my breath away but not in the good way. That right hand on the chest. Ugh. Wow! I was speechless when her photo popped up on the screen. Is this really the best photo they could have chosen for her? Poor Iko. Next Top Model shows always make a big deal about the makeovers: who gets the wackiest haircut, or who cries over having her hair cut short. This cycle none of the makeovers were drastic or over-the-top. Not the most entertaining thing to watch, but at least no lives and/or modelling careers were ruined. All of the girls’ new hairstyles still look like actual working model’s hairstyles. Because the goal is actually to make them top models, not showcase the latest, weirdest hair trends. I also didn’t like how the hairstyles were “revealed”. It was too anticlimactic. Previous cycles had the dramatic mirror reveal with the girls’ loved ones to support them. Now they just had the girls… um… play with their new hair in slow motion. P.S. Be a babe and tell me where I can buy those Alicia Keys-ish head-wraps the models were wearing to temporarily hide their new hairstyles. The production on this photo shoot is reminiscent of early Cycle 1 or Cycle 2. I loved the set, and all of the girls, including the model mentors, seemed to love it too. Unfortunately, we had to get these results where only 3 or 4 girls looked like ballerinas, and the rest were just… girls jumping in black and white gowns. Maybe, if they had a ballet workshop before this photoshoot, maybe, the girls could have performed better. And that could have been good TV as well. We got a lot of good soundbites in the dance class last cycle, if I remember correctly, so that was a missed opportunity. Let me just commend the production for bringing in”Mean” Tu (get it? because she’s Minh Tu) as an alumni mentor. It is, hands down, the best decision you have made in all six cycles of Asia’s Next Top Model. Out of the three alumni mentors, she seems to be the most blunt with her comments. If she’s not proud of your performance, she ain’t gonna sugarcoat anything, honey. If she’s not happy that you’re wasting her time watching you under-perform in a shoot, she’s gonna tell it straight to your face. She’s ready to comfort you and give you a pep talk if you need one, but when it’s time for work, she means business. I don’t know if all of the soundbites she’s been giving are all hers or if they were handed to her by the writing staff; nonetheless, Queen Tu is still giving me life this cycle. I had to rewatch the episode to read what was on the page. 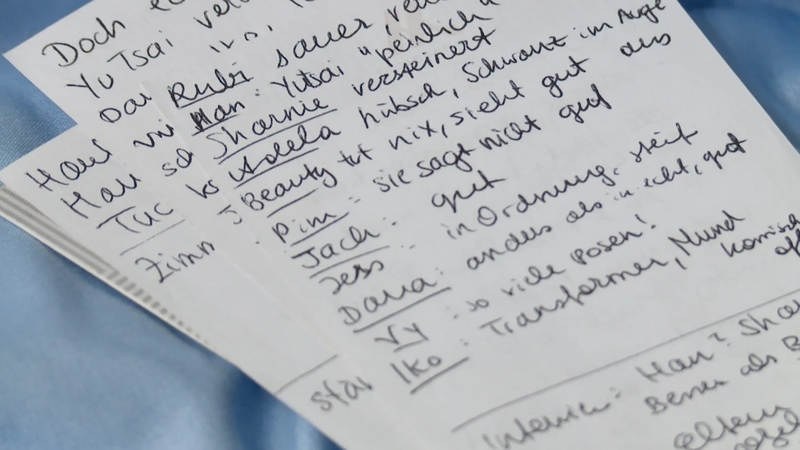 I didn’t even realize that Mia’s diary was all written in German. So either all of the “Loud Girls” knew German, or they just saw their names and thought “Oh, they must be all bad things about us,” or, again, the production was all “Yes, bad things. Yes, drama.” (Sorry, production. Still love ya! 😂) Now I only know elementary German, but I can see a lot of gut (as in the German word for “good”) in that screenshot. Well maybe except for Pim’s, which literally says not good. To be fair to the other girls, it would be a little weird if your roommate is taking notes about all of you, right? AsNTM5 winner Maureen Wroblewitz is back. Yay or nay? The girls will be having a Subaru photo shoot this early. Will Glenn Tan make an appearance? That was a rhetorical question. What do you think of Asia’s Next Top Model Cycle 6 Episode 2? Any particular thoughts on the episode? What was your favorite moment? Sound off in the comments below. Also, don’t forget to vote for your favorite girl in the poll: Who should have been the FCO for Episode 2? Poll closes right before Asia’s Next Top Model Cycle 6 Episode 2 on Wednesday, 9 p.m. on FOX Life. Please check Mis blog she explains everything about the diary and being two face in the competition. Saw that also. I would do the same thing if I was a contestant.